Solar technology has been increasingly in demand amid the worldwide energy crisis. The United Kingdom (UK) has been no exception. Fossil fuels are potentially limited while the use of oil and coal increasing amid a rising population. The pollution caused by these fuels is also a concern amid the issues of global warming and climate change. There is thus a demand for an energy source which is abundant and clean, and solar energy is practically infinite and is clean. Solar technologies remain of interest as they continue to improve and are implemented in various locations in response to the energy crises. Solar energy can be obtained in two forms, through photovoltaic cells which generate electricity, and through solar thermal panels which generate heat energy. Climate change and the concern of leaving what is commonly known as a “carbon footprint” (level of pollution generated by some organization) increases the demand for solar solutions worldwide as well. Solar energy, while helpful, however can only solve so much of the problem as technology and other limitations prevent it from being a complete solution to clean energy needs. The following will explore the potential for solar power to meet modern demands for renewable and clean energy, with emphasis on implementation and potential in the UK. More specifically, this essay will inquire “how far can solar energy solve the UK's current and future energy needs?” Although the future is unknown, current trends will be analysed while future potential logically projected. Ultimately the discussion will conclude that while beneficial and worthy of implementation where possible, the clean and efficient solar energy can current only serve as a supplemental energy source to the UK's and developed world's needs. The ability of solar energy to meet the UK's future needs is possible only through the (albeit predicted) evolution of technology in capability and affordability. To best consider the potential of solar energy to solve energy needs in general, consideration should be given to the design and functionality of the technology. Solar technology utilized to harness physical electrical energy is one method by which the sun's energy can be used to meet the energy needs of people. The term given to this area of the technology “photovoltaics,” is now a major field of scientific research. The basic of photovoltaics is the solar cell, which is a semiconductor (commonly silicon, although many others are used) which converts the radiation to usable electricity. One area of the semiconductor technology which makes it especially beneficial for use in society is that their conductivity may be easily changed through the introduction of foreign materials into their crystal lattice, which in turn can improve is energy generation. Using cutting edge materials science, knowledge of physics, and advanced engineering, the solar technology which has been considered in the 1970s has evolved to become much more highly efficient, variant in design, developed in sophistication, and holds much more potential to meet the various (albeit rising) energy needs of society. The processes involved in the technology rely on the physical principles of conductivity, radiation, and electrons (Jacobson 2009). According to the European Commission the complexity of processes involved is evident when considering the initial underlying processes, evident with “the fabrication of a photovoltaic solar cell, silicon, which has four valence electrons, is treated to increase its conductivity. On one side of the cell, the impurities, which are phosphorus atoms with five valence electrons (n-donor), donate weakly bound valence electrons to the silicon material, creating excess negative charge carriers. On the other side, atoms of boron with three valence electrons (p-donor) create a greater affinity than silicon to attract electrons.” (p. 5). This combination allows for the electrons to react, diffuse, create electric fields, and collect within the semiconducting material (through similarly sophisticated processes.) These processes continue as the sun continually radiates as the electrons collect in a battery which can then be used to power human needs through the conventional form of electricity. 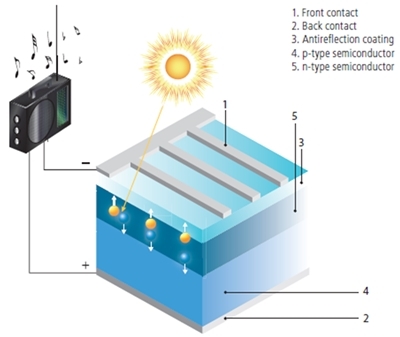 The figure below depicts the basic design of a solar cell. The development of technology has brought about variability in the design of solar cells, and thus there are many kinds of solar cells available using variations of semiconductor and energy transformation technology. The majority of the currently available cells use some variation of silicon cells in a wafer form, while these wafers are generally either cut from a sole crystal rod or are cut from a cube containing numerous silicon crystals. More recently developed solar cells make use of thin films, which can be produced with less money and in larger amounts in comparison to the silicon cells; however, though they are less expensive and bulky, they are also less efficient. Thus, organizations such as those in the UK must weigh the benefits of the various technologies available when selecting a custom solution which best meets their resources and needs. As mentioned, there is a form of solar technology which creates heat energy rather than electrical power through stored electrons. These thermal energy transformers collect the energy from the sun while meeting the heating demands for air, running water, pools, food, or other needs as they exist in the UK or elsewhere. The level of solar radiation received across the UK and around the world is large enough for solar thermal technology to be a major part of the efforts to find clean and efficient renewable energy. Naturally, heating needs are a substantial part of the energy needs in any society, and thus meeting these needs would reduce the need for gas or electrical power. The solar thermal collector collects radiation to produce heat, while there are many different types of designs to meet the heating needs of a variety of areas. The thermal collectors themselves may consist of a flat plat, an evacuated tube, a 'thermosiphon,' or other devices (SEIA). The flat plate solar collectors are the most commonly used type of solar technology in industry and residential areas, while newer technology continues its attempt to improve in the areas of efficiency, effectiveness, cost-effectiveness, and materials science. An example of the underlying processes in transferring radiation to solar power is described by SEIA “copper pipes are affixed to an “absorber plate” contained in an insulated “box” covered with a tempered glass2 or polymer “coverplate.” Evacuated tube collectors consist of rows of parallel, transparent glass tubes. Each tube encloses an “absorber” assembly, and the entire tube is “evacuated” of air, leaving a vacuum; this vacuum acts as a highly efficient insulator, since air is required to transmit heat from the absorber to the glass. A fluid transfers the heat from the solar collector to a storage tank, where it is distributed for water or space heating purposes.” (p. 2). Evacuated tubes are especially useful for higher temperature or when higher volumes of water are required to meet the needs of a facility. These processes are less complex than the transformation of energy in photovoltaics, making solar heating possible through materials in a hardware store and more easily creatable in low-income countries. Solar heating has great potential to meet the heating needs of the UK as described below. It is common knowledge that sunlight provides the UK and the rest of the world with light and heat as it drives the climates and ecosystems of the planet. 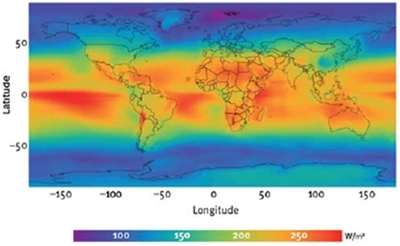 The figure below reveals the radiation available to the UK and the rest of the world. While the solar radiation continuously available to Earth (162,000 terawatts) is much greater than the average world power consumption in recent years (15-17TW,) solar energy currently meets only .1% of the world's energy consumption. The utilization of photovoltaics and solar thermal power has the potential to provide the UK and the world with a renewable source of energy that is also low in carbon emissions. Furthermore, the technology may thus be used to combat the growing concerns of climate change. Some nations, including the UK, have begun to employ solar technologies as a means of addressing these issues in residential and industrial installations; in this, analysts consider the potential for solar energy to meet the UK's overall needs. The following section will consider the reality of implementing the current technology, however will be mindful of the likelihood of price decreases in technology (similar to the falling costs of computers, etc) and the potential for current efforts to result in more effective energy production. Solar energy does not seem to have the potential to solve the UK and world's energy problems, however it has the potential to make a substantial impact in this effort. The intermittent nature of solar energy may seem less than desirable for implementation within the UK, however the potential benefits in addressing demands for reduced carbon emissions and renewable energy is substantial. Government officials have been encouraging solar implementation and consideration through its own extension of incentives, and thus have been taking action for the implementation of the technology within the country. The UK government is aware that the potential of solar hot water systems in supplying up to 70 percent of residential hot water needs in the UK, while the sunnier climates of other nations could potentially have all of their domestic water needs met; this consideration of potential is with regards to implementation efforts, and assumes that the technology is available (rather than defining potential by the potential for technology not current in existence to make such an impact). A major limitation to such an effort is the initial investment required, as the primary expense for solar hot water heating is the manufacturing and installation of the equipment. This makes government incentives attractive to residential and industrial parties, however the funds are nonetheless a common obstacle. Government incentives have also been a motivating factor in the development of photovoltaic manufacturing. The evolution of photovoltaic panels have come to a third phase, evolving from the first phase of 12-20 percent efficient silicon wafers to the less efficient but less expensive thin films described, and now the third phase seeks to maximize known scientific processes (while it is still under development). Government incentives may less in demand if the technology is completed, as the benefits from an 86.8 efficient system are obvious; currently, the best working models are 40 percent efficient, however the manufacturing costs are very high. Naturally, the potential for solar energy to aid the UK depends on the amount of equipment, its efficiency, and the amount of sunlight. The UK has lower levels of sunlight than other nations, however this does mean that the country cannot see great benefits from the solar technology. Solar panels which may be used on rooftops have been commonly manufactured and installed in the nation, while many have even sold excess accumulations to electric companies for distribution. Lenses and mirrors have also commonly been used to concentrate the low levels of light in the UK, and third generation solar plants can now be manufactured to create solar energy with a 31 percent efficiency. The future of UK's energy needs is more predictable than the development of technology, while the potential for solar energy to largely supply the UK's energy needs is dependent on two primary types of technological advancement: increasingly cost-efficient production and improved energy conversion. As mentioned, solar technology has been increasingly in demand amid the worldwide energy crisis, while UK has been no exception. Solar technologies continue to improve in response to the energy crises, and solar energy can be obtained in two forms, through photovoltaic cells which generate electricity and through solar thermal panels which generate heat energy. In this, solar energy, while helpful, however can only solve so much of the problem because technology and other limitations prevent it from being a complete solution to clean energy needs. Considering the inquiry of “how far can solar energy solve the UK's future energy needs?” results in the realization that the potential exists but is limited. Ultimately, while beneficial and worthy of implementation where possible, the clean and efficient solar energy can only serve as a supplemental energy source to the UK's needs. While the solar radiation continuously available to Earth (162,000 terawatts) is much greater than the average world power consumption in recent years (15-17TW,) solar energy currently meets only .1% of the world's energy consumption. Perhaps the developed (albeit cloudier) UK will be able to make the most of technology as it reaches the 86.8 percent thermodynamic limit in conjunction with plants utilizing lenses and mirrors for concentration. The potential for solar energy to supply the UK's energy needs while reducing carbon emissions is clear and worthy of continued pursuit. Despite the UK not being a particularly sunny nation, the importance of solar energy technology should not be overlooked. Although solar energy does not have the potential to solve the UK's energy problems, it has the potential to make a substantial impact in this effort. The intermittent nature of solar energy may seem less than desirable for implementation within the UK, however the potential benefits in addressing demands for reduced carbon emissions and renewable energy is substantial. Government officials have been encouraging solar implementation and consideration through its own extension of incentives, and thus have been taking action for the implementation of the technology within the country. There is greater potential for solar heating technology to assist the nation. However, improvements in the expenses required for photovoltaic technology (as well as its levels of efficiency) must continually increase the potential for it to have an impact on current energy needs. Presently, the energy required to manufacture a solar panel is on the order of one to four years of the panel's operation, and while the durable silicon panels may last up to 30 years, both the demand for investment and potential for future assistance are evident. It is unknown as to how long it will take for newer and more efficient technologies to be fully developed, and until this technology is practical for implementation across the nation, the assistance of solar panels for in providing electrical energy is limited. Solar technology can provide a great assistance, however other renewable energy sources such as wind power or nuclear may be a better solution for the UK until the solar technology is both cheaper and more efficient; solar technology should not be ignored in either its potential or limitations. The potential for solar energy is unknown pending the development of technology, while the existing technology has been assumed to have the potential to have a substantial impact on UK energy. Future technology may very well hold a greater potential, and while some have proposed that using only a portion of the world's deserts for solar plants may provide the world with its energy needs, great funding and organization for such an effort would be required assuming the technology is even currently capable of such a feat. Currently, as mentioned, more considerate and realistic estimates have assumed that solar heating could accommodate up to 70 percent of the UK's heating needs; meanwhile, the International Energy Agency has recently estimated that solar energy could provide up to 11 percent of global needs by 2050, which is a far way from a solution but a clear resource for assisting with the current challenges. Current technology better allows the harnessing of heat energy than the transformation of electricity, however the potential will rise with improvements in the cost-effectiveness and capability of technology. Canivan, J, 'Five Solar Thermal Principles', JC Solarhomes. Connor, S, 'The real global warming swindle', London: The Independent. Ekins-Daukes, J, Solar energy for heat and electricity: the potential for mitigating climate change. Grantham Institute for Climate Change Briefing paper No 1, Imperial College, London. European Commission, Photovoltaic Solar Energy: Development and Current Research. European Communities. Luque, A, and Hegedus, S, Handbook of Photovoltaic Science and Engineering. John Wiley and Sons, New York. Mills, D, 'Advances in Solar Thermal Electricity Technology', Solar Energy, vol. 76, pp. 19-31. Solar Energy Industries Association, Solar Thermal.